Pearl Academy, institution for design, fashion, creative business and media, organised Career Couture in association with FDCI's India Couture Week 2017. 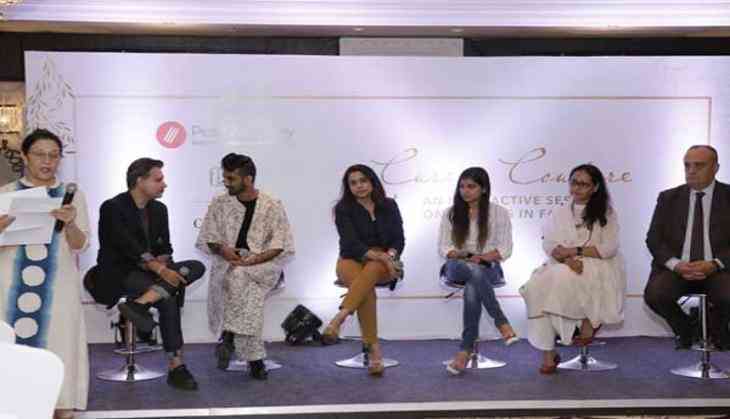 It was an interactive session on Careers in Fashion by renowned fashion designers. The fashion designers narrated their life from a fashion designing student to a fashion designer. The event witnessed guests from education sector, fashion designers and Pearl Academy alumni. Anju Modi (Fashion Designer), Pervin Malhotra (Career Consultant), Alberto Bonisoli (Head, NABA), Divyam Mehta (Fashion Designer & Pearl Academy alumni), Sumiran Kabir Sharma (Fashion Designer & Pearl Academy alumni), Priya Arora (Fashion Designer & Pearl Academy alumni) and Damini Deshwal ( Fashion Designer & Pearl Academy alumni) shared their experiences and knowledge about careers in creative field like Fashion with the aspiring designers. This interactive session ended with an interesting Q&A round, leaving the young audience inspired and thrilled for their future.